All About: Sherwin Williams Repose Gray – Undertones and More! Are you looking for the perfect gray paint colour? Are you nervous about those sneaky green, blue and pink undertones? Well don’t be (insert Superman song here) as I’m on a mission to de-mystify my fave shades of gray, and today, we’re chatting about Repose Gray SW 7015. Repose Gray is a gray paint color (I’m not just good-looking you know). However, it is not a TRUE gray as it has a weeee wink of a brown/taupe base. Now technically, taupe is a gray/brown blend, however, some taupe colours have a subtle pink or purple undertone – Repose Gray has a touch of purple in it. Don’t be scared. When I mention pink or purple, people often get nervous as they are 2 of the least-liked paint colors. However, these little hints of undertone can simply be what softens a colour and can stop it from feeling flat, dull or cold – particularly in darker or north facing rooms. That being said, I’ve had a few e-design clients who’ve found Repose Gray to pick up a bit of a blue or even a wink of green undertone. This usually happens in north facing spaces and rooms that have a lot of greenery outside the window and it IS something to keep in mind as Repose Gray can be a bit unpredictable sometimes (so make sure to paint up LARGE sample boards). Repose Gray has a gray base with a subtle brown undertone. Now because you’re probably beating your head against the wall trying to find the perfect gray, I’m going to assume you happen to have a sample of BM Gray Owl on hand (if not, you should run to the store and grab one) or read about it here. Gray Owl is one of Benjamin Moore’s top dogs and is a GREAT colour to show you how different 2 grays can be. What does this mean to you? Well, it means diddly-squat if you don’t know what LRV means! LRV basically refers to the amount of light a colour either absorbs or reflects back into the room. On a scale of 1-100, colors that are below 50 tend to absorb light and are a bit heavier/darker feeling. Colours that are above 50 tend to be brighter colours that reflect light back into the space, adding a nice energy and vibrancy. This means that with an LRV of 60, it won’t feel like a ‘weighted’ or heavy colour. And while it won’t add a TON of reflective/light value to the room, it’s still a light and brighter feeling colour. If you want to learn (in layman’s terms) about LRV, check this article out LRV – What Do The Numbers Mean? In a room with average natural light, Repose Gray holds itself well, sitting in the light zone but not TOO washy. Repose Gray is undoubtedly at its personal best in spaces like these – its LRV of 60 is in its happy place! Repose Gray can also look a touch heavy in a darker/low-light room as it doesn’t have enough ‘colour’ in it to overpower darker areas or corners. That being said, it’s still a beautiful soft colour. Because Repose Gray has an LRV of 60, it doesn’t become too washed out in an ultra-bright room. And while ‘overall’ it will feel a bit lighter than you think it will, it still holds itself pretty well. Dorian Gray is kind of like a darker version of Repose Gray and is almost as popular. If you are finding Repose Gray a bit too light for your tastes then check it out! You might find its undertones a bit more predictable. 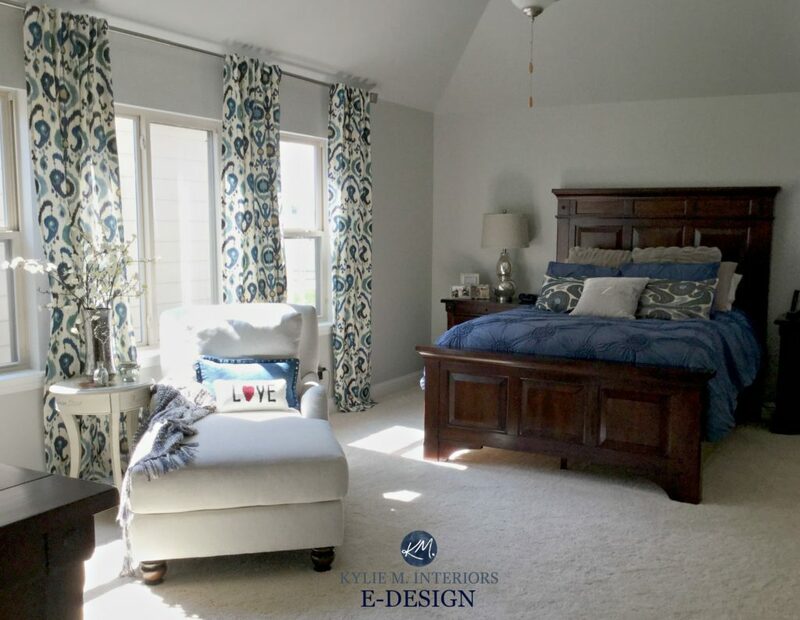 If Repose Gray isn’t for you and you would like advice on finding THE PERFECT paint colour, check out my Affordable Online Consulting / E-Design Services! Yaay…a SW color that I will have to look into to!!! Hi Robin, HOLY DELAYED REPLY – sorry about that – I got a bit backed up! Thanks for loving the grays I talked about – I know, I easily get obsessed on a colour too (Gray Cashmere is a current obsession even though I don’t have it in my home). Thank you for commenting and keeping grayin’ on my friend! 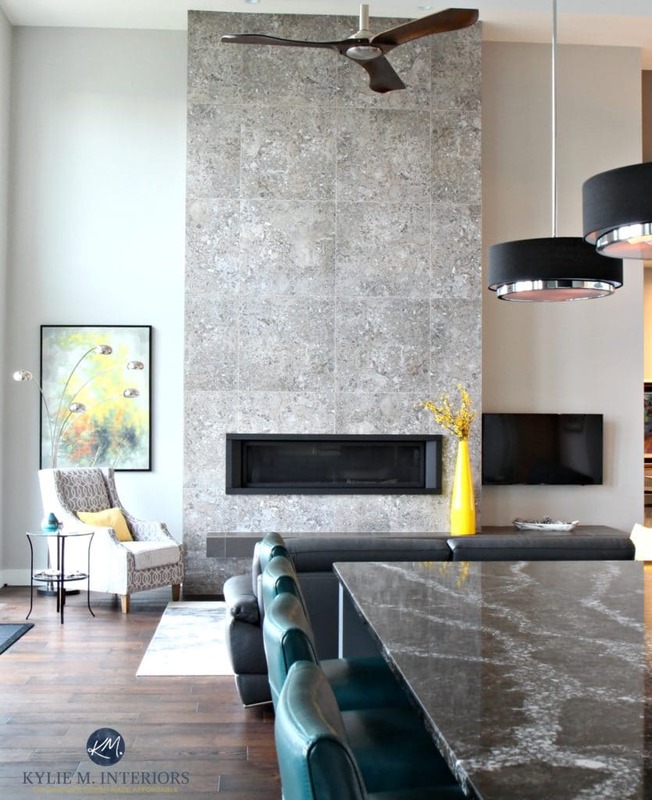 I have an accent wall that is Fairview Taupe by BM in a large great room with a lot of natural light. Do you think Repose Gray would work for the other walls? Hi, I have a simple question that I would love some advice on. I’ve been in search for the perfect gray for my master bedroom for days. Every time I think I found one, I change my mind . Our room is large and has three giant window which provide a lot of natural light. We have dark brown bedroom furniture with a little red in it and dark black leather on our headboard with the dark brown wood on the outside . We are looking for a “darker gray” we hate blue undertones. We’d like to avoid anything to green/pink/purple. If we have to have a undertone I think a slight green would be acceptable. I think we’d prefer a slight brown undertone if anything. We want it warm. We have lighter colored neutral carpet. I was thinking of Rockport gray, Chelsea gray, Plymouth Rock? I don’t know. Can you recommend a couple grays please? Thank you! I would love and appreciate a email if you have time . Hi Brian! Now I refer most questions to my Online Consulting as it is my livelihood, but I will give you a heads-up that Chelsea Gray is a LOVELY medium toned gray with very little undertone, as is Amherst Gray, the slightly darker version of Chelsea Gray – hope that helps! After much debate and color sampling to decide which shade of grey to go with for my main open living space, I’ve decided to go with Repose Gray!! This was only after having my choices narrowed down to its 3 contenders, Agreeable gray, Collonade gray and BM Revere pewter. While I liked all 3 of them in my space, neither of these choices seemed to jump out as the “ONE”. Then I came across your wonderful article about Repose gray, and I just had to run out and buy a sample to try it… BINGO!! It’s perfect for all the reasons stated above! Now I’m trying to pick from a large selection of white trim colors to go with it. Do you happen to have any favorites that you can suggest? Hope that helps! If you loved reading my blog, please consider subscribing for weekly updates (right hand side of page) – it’s free! I’m thinking of making the switch to Sherwin-Williams, and am curious which of the Sherwin-Williams lines of paint you prefer. We are thinking of Repose Gray in a flat finish for a family room. Thank-you for your great gray articles! Hi Karen! I love SW paints. If you are in Canada it’s the Opulence line, if you’re in the States its called Cashmere. Its the middle of the road and I love the quality/price point. Now keep in mind that flat finishes can be ‘wipeable’ (barely) but not washable. I’ve yet to find a good washable ulti-matte paint! I am in a bind. I have never had the chance to get my house professionally painted, and it’s coming up soon. I am between BM’s Owl Gray and SW’s Repose Gray. I have them both up as samples, and they are both beautiful. They both change so much as the light changes throughout the day. I am just worried that their undertones may eventually clash with our furniture. Orange couch, turquoise buffet, fuchsia, indigo, and mustard/gold accents. I think neutral color walls with help balance the flair, but would just hate to see the clash. Any help on making the final pick? Your articles are great by the way. Seriously. Hi Karin! Usually I refer these questions to my Online Consulting, but I DON’T want you making the wrong choice and your 99% there! So yes, these 2 colours will change a lot throughout the day – particularly Repose Gray. In some lights Repose will be a bit more gray, another a bit more greige and yet another, a touch of purple. It’s the touch of purple that is going to BAD for your lovely accent colours! Funny enough I was just at a clients house yesterday and she has some of those EXACT accent colours – various shades of turquoise, orange, gray and white (none of the other colours though). Now she has Revere Pewter on her walls, which is very pretty, but I think I might have chosen BM Gray Owl had she asked. Why? Well Gray Owl also changes throughout the day – sometimes gray, sometimes blueish, sometimes greenish – but it wouldn’t matter WHAT it did, it would still look good with turquoise, orange, mustard, indigo to a degree and fuchsia somewhat. Hi Sheila, it can depend on the room as Classic Gray can go quite warm or quite gray. If it goes warm I don’t know if it feels QUITE as nice with those accents, but not bad. I just am getting ready to buy this color for my open concept kitchen/dining/family room, south facing light (mostly- it’s a space that has east and north windows, too). I was surprised to find out that they recently reformulated it and it now has an LRV of 58. I hope this won’t matter too much- it’s the best color out of Revere Pewter, Gray Owl and Worldly Gray. I’ll post a pic when I get it on- I just know you said no lower than 60 LRV for spaces that you want the light to dance (which I certainly do!). Thanks for your blog- it rocks. I never would have know about LRV without it! I love your column. And I too love Repose Gray. I just painted my entire basement this color. It’s my husbands man cave. There is only 1 little tiny window so it’s very dark down stairs. We initially wanted a blue but everything blue looked overwhelmingly blue in the dark space. Repose gray (which I had a sample on hand for my upstairs and didn’t like) was perfect for our basement. It looks almost slate blue in some lights and then back to gray. We both love it and wanted to share our experience as I just finished painting last week. Which white do you think looks best with Repose Grey? I am thinking for our kitchen cabinets. I am wanting a warm white look, not stark. I am doing the walls Repose Grey and had originally thought Simply White for cabinets and am now second guessing myself and wondering about Chantilly Lace. But I worry it may be too cool looking. Hi Danielle, sorry for the delayed reply! I actually like BM White Dove with Repose Gray. Chantilly Lace ‘can’ look a touch pinky and Simply White is beautiful and you COULD do it, I just prefer White Dove! Great article. Thanks for helping us with this color dilemma. The different photos helped also. Quick question, we have decided to paint the house in SW Repose Gray and bedroom and bathroom in SW Sea Salt, but trying to decide which paint finish to go with is the hard part for us. Our walls have a texture and there a certain rooms that get a lot of natural light. Please advice. 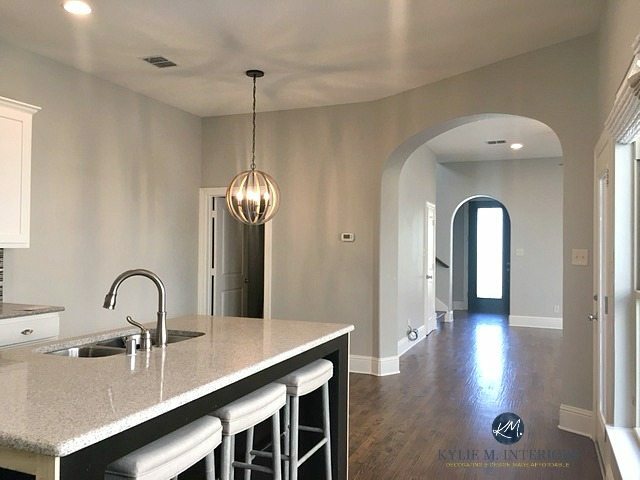 Do you think Repose grey would pair well with Alabaster on the cabinets and trim? Thanks!! Hi Kay, yes Alabaster and Repose Gray are a beautiful combo together! I absolutely loved my swatch of Repose, so I ran out and bought a 5 gallon bucket and went to town. My trim is Decorator’s White and now that everything is done I don’t have as much contrast as I thought I would when comparing the 2 color swatches on my wall. When I look at pictures online (I do know I can’t trust colors on monitors), it seems every other room I see it in, there is blatant contrast. I have tons of natural light, do you think that is the reason or was my white color choice not bright enough? I strike out on every paint job I do it seems! I’m debating changing my white color or going Mindful or maybe 50% of Mindful added. Paint colors are so hard! Hi Jacquelyn! I know, Pinterest can be SO deceiving as to how things will ‘really’ look. A lot of the images online have been edited, particularly the more professional ones on Pinterest/Houzz. In a really well-lit room, REpose Gray will still show up to the party, but you wouldn’t see as much contrast as you might see in a more average/moderately lit room. If you have great light, I might just bump right on down to Mindful – and since they are in the same colour range you might just need to do 1 coat if you do a good job! HI Kylie! 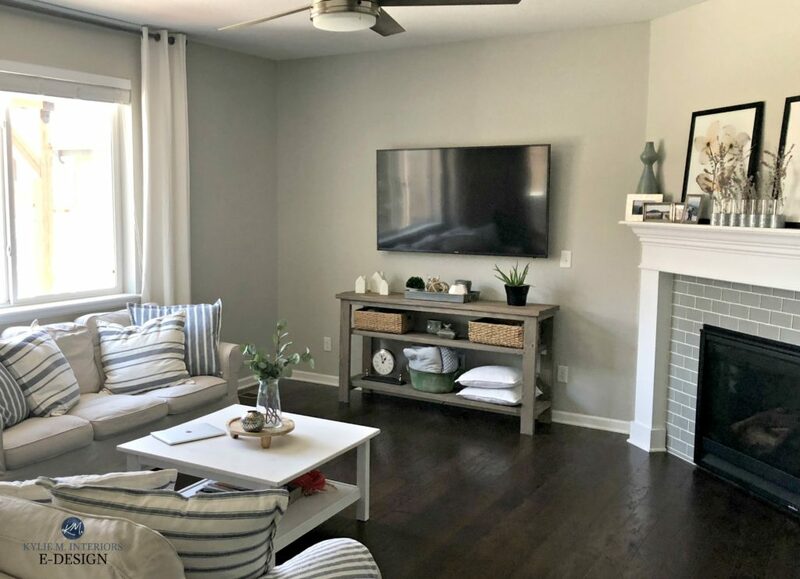 So I came across your post a few days ago when my husband and I were deciding paint colors and we decided we wanted a warm gray to compliment our brown wall cabinets and vintage White kitchen Island with cherry hardwood floors. But the painters just finished painting the repose gray all through our living room and kitchen and it almost looks blue! Kind of like SW passive. Have you ever heard of anyone seeing a blue undertone in repose gray? Or do you notice it in your house? I thought it may have been because the painters didn’t use a primer and the original walls were yellow and hunter green. But they did do two coats. I’m so bummed and confused :/ I thought repose would look a little beige if anything! Curious if you’ve seen or heard anyone else say that it looked like it had a blue undertone in certain lights. What color gray would be better with cherry floors? 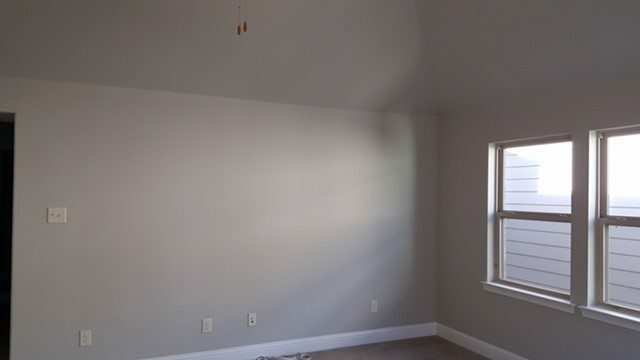 I painted my daughter’s room in mindful gray. Looked great! Used Agreeable gray in the bathroom and it looked beige, so I switched to mindful on the cabinet and repose on the wall. Repose is totally light blue. And you would never know the mindful on the cabinet is the same as the wall. I then painted my kitchen repose gray and it too looks blue. Only this time I wanted the blue undertone because my kids did not want me to change the bluish gray cashmere that was already there but I wanted a change. Oh, and just about all soft grays look lavender in my hallway! Even after I changed the lightbulbs too. These colors are so dependent on the lighting…. I know Karen, isn’t it just mind boggling! I’ve found that Repose Gray, IN PARTICULAR, is one of the BIGGEST chameleons in the gray world too! Do you prefer collingwood or repose gray and why? Well, I like them both in different situations, but ‘overall’ I do like the softness of Collingwood Gray. It has a bit more beige in it, so it has a bit more warmth to it. However, if you are more of a ‘gray’ fan than a ‘greige’ fan, Repose Gray would be a much better choice! So we just painted our whole dining living AND kitchen in Repose because I figured how could I go wrong with all this love…BUT it really looks BLUE! Like light blue! Im shocked!! Im freaking out a bit! Do you know what it is or why?! Maybe I just need to get everything back in the room???? Help!! Hi Cassie (great name by the way, that’s what we named our daughter!). You know, I’ve had a few clients have Repose Gray pick up a blue on them. Once it was a mistint from the paint company and the other times were in shadowed or north facing rooms. Could this be the case with your home perhaps????? Hi, we have dark brown trim throughout our house. Will the repose gray go with that?? Hi Nichole, yes, Repose Gray usually looks quite nice with dark brown trim! Hi – Have you heard of mixing 50 % mindful gray with 50% repose gray – and what the results might be like? Hi Mary, nope I haven’t heard of that! Usually i just suggest either lightening one or the other – I’ve found that 40% is the magic number that does the trick to get me ‘in-between’ 2 colours. Hi Kylie – I can’t tell you how helpful your blog has been to me!! We recently bought an old 1930’s fixer upper on 40 acres. The house is a big L shape – lots of big different facing windows hallways, high ceilings, dark staircase, etc…outside trees – but still good light. Because of multiple window directions…the light changes by the minute! I wanted to brighten it up with grays, but about $500 later in various BM gray paint choices…everything, and I mean everything, kept turning blue – pink blue, purple sweet tart blue, periwinkle blue…ugh! I would use a sample, and it would look great, but then show up completely different on 2 walls in the same room! I found your blog, switched gears, and grabbed samples of all the paints on the SW Repose, Mindful, Dorian strip and…voila! I had to change shades from room to room according to the light – but it all flows and looks really pretty. There are still some slight blue undertones, but mostly just a nice fresh, gray feel. 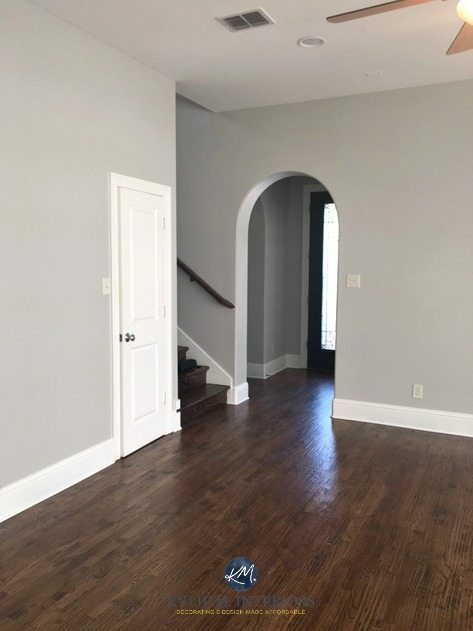 To note – the Mindful is a welcoming bluish/gray in the bright foyer but looks the exact same color as the Repose in another hall/office/breezeway…the front room and DR which are immediately off the foyer, are in Dorian – but only a little darker looking than the Mindful! A half bath (small but decent window) in Mindful has not even a smidgen of blue…but more taupe, and looks darker than the Dorian in the DR. Thanks so much for all the great info – hopefully, this may help another poor soul stuck in the gray blues!!! Hi Laurie, sorry for the delayed reply and I’m SO glad you’ve find my blog helpful! And you are RIGHT, I LOOOOVE me some White Dove! Eider White is pretty but can have a vague purple undertone. Bad? No, but I like the subtle neutral warmth of White Dove, particularly if a lot of your colours are flexing to the cooler side rather than the warmer side. Also check out BM Calm https://www.pinterest.com/search/pins/?q=benjamin%20moore%20calm&rs=typed&term_meta%5B%5D=benjamin%7Ctyped&term_meta%5B%5D=moore%7Ctyped&term_meta%5B%5D=calm%7Ctyped which is like Eider White but with a weee wink of softness/greige to it. We have to choose our interior pint color on our house being built without seeing samples on the wall.s. It will be the same color throughout the entire house. Our trim and cabinets will be pure white. I have it narrowed to repose gray, light French gray, and knitting needles. I am so scared of undertones. Any suggestions?? Hello I love your Blog, you give excellent advice. I am going with BM Gray Owl bcs of your advise, my furniture is gray and accents are coral, yellow and aqua. My problem is that my Living Room, Dining room and kitchen are right next to one another with very little wall space in between the LR and DR. The Dining and Kitchen are connected (one room). My kitchen cabinets are all white, dining table grayish silver. I have 6 windows in the Living Room, and 1 window in the dining room/ kitchen area. Yes, very dark area. Should I paint the dining/kitchen another color? only 2.5 walls in dining room (1 of those has the lonely window) and little wall space in kitchen mostly cabinets and appliances with an Island. I was thinking about yellow, but what shade of yellow should I use with BM Gray Owl? Or paint all the rooms with Gray Owl, since they are in close proximity of one another? I will be forever grateful for your advice. Your blog has been enormously helpful to me. I can’t thank you enough for all that I’ve learned! The painters are coming in 2 days and I’m still on the fence about my kitchen wall color with my cabinets to be painted Dorian Gray. I’m using Repose Gray in the den, foyer, up the stairs, and in my husband’s office. For some reason, I just can’t commit to Repose on the kitchen walls….so much gray. I saw your thoughts on Eider White (purplish-ick) . My painter likes Pearly White with it. I’d like a decent contrast with the white trim. My table and chairs are orangey wood and the floor a light , neutral tile. My fingers are crossed with the hope that you can advise and celebrate with me the passing of my old oak cabinets! Hi Kris! it’s really hard to consult without seeing photos (which is why I usually refer to my e-design) but have you looked at Agreeable Gray for a subtle shift into something a wink more greige? I’ve painted my kitchen and entire first floor Repose Grey. I want to paint my cabinets and I’ve been sitting on this decision for months! I am trying to decide between Dovetail, Pavestone, Acier or Gauntlet Grey for the cabinets. Any thoughts on a good cabinet color to go with Repose Grey walls? Thanks so much for all of your great posts! Hi Sara! Well the best advice I can give is that cabinets seem to look lighter than you THINK they will once all is said and done – so with that being said, I would lean toward Dovetail as the ‘just right’ choice – not too dark, not too light. Hi Ashlee! I have to say that the one problem people don’t have with Repose Gray is beige and in fact it sounds like it could work really well for you! The amount of beige it has in it is SOOOOO fractional – it barely qualifies as a warm gray and doesn’t even TIPTOE close to greige. I’ve also had it pick up a variety of cool undertones that you’d find in those more traditional cool toned grays such as blue/green/purple. I don’t know, it sounds like it could be just fine to me! I had no idea it would be so difficult to pick the perfect shade of gray. We currently have samples of repose. Passive, knitting needles, lazy gray, front porch and Argos on the walls of our living room, entry and stairwell. None of these areas receive a great deal of light but the colors look different in each spot. All will be against white trim but the living room is adjacent to the dining room which is painted a light sage/mint green. Although we were in search of a true gray, we are leaning toward repose as most of the others look too dark and passive a bit blue. Any suggestions would be greatly appreciated. Hi there! We are expecting a baby girl and just painted the nursery BM Stonington Gray. The swatches we painted looked beautiful (which is why we chose it), but now that the room is painted it is reading WAY too blue. I am a fan of warm grays – my favorite is Mindful Gray, which I have used in a number of other rooms in our home. I am considering repainting using that, but really wanted a lighter gray so I was thinking of using Repose Gray since they are in the same family. Do you think Repose Gray will read blue since Stonington Gray did? Would I be better off lightening Mindful Gray? This room has one east facing window and our trim is cream (not a true white). Thank you! We are painting our basement repose gray, thank you for a helpful review! We are trying to find a nice coordinating color for the full bathroom that is in the basement. Though it’s a full bath it’s very small and has no window since its in the basement. I like Cucumber and white mint through Sherman Williams, but do they clash with Repose Gray? Any other suggestions? Thanks!! We’re designing a house with a warm midtone wood look tile, beige carpets and white kitchen/white quartz (no warm tones in the kitchen). Most of the house has nice natural light. Would Repose Gray sound like it could work for the whole house, to break up the “beige”? Or would a warmer floor clash w/ the purple/pink undertones? Hello! What an AWESOME space to stumble upon! Extremely helpful!! We are building – open ranch. I’m stuck between agreeable gray and repose gray. Cabinets and trim will be SW pure white. Our kitchen island, beams, and stair railing will be stained. We will have LOTS of natural light. Which colors would you go with? Wellll, if it were me, while EVERYONE ELSE seems to grab Repose, I’d go for Agreeable. I like its flexibility. It can look like a greige, but it can just as easily lean considerably more gray and pick up a vague cool blue (given the right exposure). I just think it’s fab. Repose is great too, but I find it a touch heavy (in which case you could lighten it by 25%) but I DO miss the very subtle warmth/balanced that Agreeable offers…hope that helps! Normally I send questions along to my E-design, but you caught me at a good time! I am doing a kitchen remodel. My den that my dining room opens up into is new (recent ad on). My walls in the den are repose grey and my trim is white. I will be repainting the dining and kitchen to match. So, my question is, if I want grey kitchen cabinets what color grey do I go with (in your opinion)? Suggestions please. Great blog by the way! I just painted Repose Gray in my dining room, and plan to carry it through the open concept kitchen and living room but the dining room is looking blue. Ive already bought a 5 gallon bucket so I feel like I’m stuck with color. My question to you is, Is there anything they can add to the tint to offset the blueish it has in our home? Scared I chose poorly! New construction. White shaker cabinets, med stain wood floors, very bright kitchen, lots of windows. Used Repose gray for the island cabinets as well as the range hood that goes to the ceiling. Walls are set to be done in Owl Gray (BM 2137-60). Will this look awful?! Cant change the cabinets but could try to change the wall color – HELP! I am wanting to paint an accent wall in my formal living room. The entire house is Repose Gray, and I have accents of blue throughout. What blue would you put on one accent wall? Love the navy trend right now? Hi Cheree, thank you for your note! I actually have an Edesign business that I’ve created for questions like yours! I try to give as much complimentary info as I can on my blog posts and if that doesn’t work, it might be time for a closer look, this way I can see your furnishings, flooring, etc…otherwise I’m totally guessing! I’m getting ready to paint my open concept main areas and am considering BM Nimbus. Am looking for a warm grey with no yellow or green undertones. Going to compliment it with a wall in BM Smoke or Sea Star. Any thoughts on Nimbus? I have. Looked at so many SW colors, and almost went with a lighter Requisite grey but think it’s too dark. Thanks!!! Hi Donna, sounds like you’re on the right track, Nimbus is gorgeous! However it is only a slightly warm gray, fractional at best. You can also look at BM Collingwood which is quite beautiful! I”m looking for a greige color for the exterior of my home. I’m looking at Agreeable Gray and Repose Gray. I seen you said both have a touch of purple in them. I am afraid in the sun, the purple will show. which would you say has the least amount of purple and would better suit the exterior of the home? Hi Erica, of the 2, Agreeable Gray might be a safer bet! I painted my family room Repose Gray and it turned green. I researched a ton to try to find the right gray for this room that has low natural light. I don’t understand how this happened? We also painted our upstairs hallway and it looks blue up there? Go figure. Can you give any insight? I would love to post a picture so you can see it but I don’t know how. Ooooo you have experienced the chameleon-like nature of Repose Gray! So, in my time using it and referring to it, I find that MOST of the time it does what it SHOULD do, which is act like a soft warm gray that favours a very vague purple undertone. However the rest of the time it slides either blue or green, more often green. The slightly darker version of it, Mindful Gray can do this as well, but I’ve found that as the colours on this strip get darker, that risk fades away. Some grays are just that way, it’s about the different colours that are used to create them, meaning that under the right circumstances, they can flash a bit green. I can’t say it’s the low natural light in particular, as I’ve used it in rooms with low-natural light with no green. Sometimes it’s the colour of the trim that makes it shift this way or the light bulbs or the exterior exposure/greenery outside. I know, it can be a bugger…I’m sorry it didn’t turn out the way you hoped! I mean, even the fact that it turned into a blue undertone in your upstairs is a bit more unique for this colour! Hi Kylie, I watched your video on repose gray which I plan to use. Can you suggest a warm white trim color? Hi Jan! Take a look at SW Alabaster which is a soft, warm white! We used Repose Gray on interior rooms (no windows) with fluorescent overhead lighting. It is lovely, but definitely shows the green undertone. That is good to know, it’s things like this that help others make their decision, thank you! Hello! We are getting our whole house professionally repainted…right now the walls are a light tan color. We’ve painted large swatches of both repose gray and agreeable gray on different walls throughout our living room. Repose looks blue on all of the swatches on the walls. Could that be due to the existing tan color that is underneath? I love how repose looks in all the pictures online but I’m so scared my whole house will look light blue. Agreeable gray looks really nice but I’m just worried it might turn out too beige and not give us a big enough difference overall. Any advice? Hi Lan! Yes, things could easily be influenced by the colour underneath. The best way to sample is to paint 2 coats on a white poster board and leave a white border around it, so you can visually separate it from the old colour. However, Repose Gray is unpredictable and I have seen it go a bit blue (but if you have different exposures in each room, it shouldn’t do it EVERYwhere. If I were to choose between the 2, I would lean toward Agreeable Gray myself as while it can lean into a slight gray-blue in certain lights, it is more of a cool greige tone. We made a white border around our paint samples and it totally changes the way we see the color! The repose no longer looks blue…it almost has that slight green undertone to it and is beautiful! And the agreeable looks more Greige/beige now! Both are such great colors and now I’m torn! In your experience…which gives a fresher feel to it? Does agreeable gray blends well with dovetail? Hi Kati, yes, they can complement each other nicely! Hi! I’m wondering your opinion on repose gray if all out trim and kitchen cabinets are Decoratirs White by BM? I’m also wondering what your opinion would be in ceiling color throughout house since our trim and crown moulding is decorators white. I’m just worried it may be too white for a ceiling. Thanks!